Good people. It’s good to be back. Forgive that long unannounced hiatus. I was in Naivasha with 20 other journalists who cover Parliament for a four-day workshop. Okay, two full days and the other two, the first and the last, were for “arrival and registration” and “departure” respectively. The venue was the Great Rift Valley Lodge. I know guys at the office realized my absence, moreso, one pal called George Ogutu, he who edits the East African. But, now he knows that I was in class. It was worthwhile, I must say. But very tiring (after all in class from 8.30am to 6.15pm. Now, that’s something huge. It is bound to get tiring. And for the record; I didn’t dose in class). I had a one-on-one with the Clerk of the National Assembly, Mr Patrick Gichohi, a tittle-tattle with Dr Fred Matiang’i of SUNY (State University of New York). After that, it was time for his majesty Martin Masinde, the Budget Officer from Kenya’s Parliament to “speak a little” about the budget-making process. Now with a topic like “Understanding Budget documents in the context of Parliament’s examination responsibility”, my mathematically-inclined mind was alert. Masinde is a pragmatist. And I liked his presentation. But before Mr Masinde, Parliament’s Director of Information and Research Services, Clement Nyandiere (yes, the one and only ‘informed colleague’) had taken us through broadcasting policies. This guy is bright. It’s amazing how he stays humble with such innate wisdom. Lawrence Amolo, he who understands Parliament’s legislative agenda and Mr Michael Sialai, the man with Parliament’s legislative memory at his fingertips were in the house. They gave a brilliant talk about the procedure of Parliament and pointers on what to look for. If they hadn’t known it from the furtive smile that escaped my face as they spoke, then they better know that I have dozens of story ideas in this mind of mine. I hope I will be able to transfer them on paper. Of course throw in tea-breaks and a lunch and that day was as well as over. But only after one Nyakundi Nyamboga, a former editor at The Standard, came in with unlimited theory about “Ethical Standards, Balance and Impartiality.” He was standing in for Esther Kamweru, the Executive Director for the Media Council of Kenya. Now sample this from Nyamboga: “Does the media work for public interest or it tries to interest the public in its own affairs?” Ha! Tafakari ya babu. That was day one gone. I went for a walk with Alex Ndegwa of The Standard in the expansive lodge in that cold Naivasha evening. But the rains threatened and I rushed to the restaurant. It is here that David Mugonyi, the Media Relations Officer, bought me a glass of mango juice (remember it was cold) as we sat in the lounge enjoying the warmth from the crackling fireplace. He enjoyed a cup of hot water, with honey and lemon. This guy knows how to keep healthy. Forget that legal and very plausible argument that in the hierarchy of clauses, one part of the Constitution can be inconsistent with another part. It’s tough being a judge. Isn’t it? PART TWO: KBC English Service...these were the days! You want to dance ‘helicopter’. It just fits. You want to shake your shoulders, just a bit (not the way they do in ‘kutalang’i). A little shoulder-shaking-arms-apart kind of dance, with your legs doing whatever they want to do. The head can nod, mbele-nyuma, or left- right, like you just took a sniff (Haa!) Yes, it is Nyanshinski’s song. When you see the ‘k’ in Jakaranda, you really want to correct it. Who writes ‘Jacaranda’ that way? Well, Peter Kimani does, and it is the name he chose for his fictional nightclub. (Ha! Had to spoil it for you this early! Perhaps I should not have mentioned that. Sorry Peter, and Bola, I just couldn’t resist!). 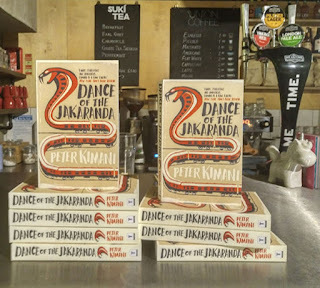 The book is not about dancing. Yes, there’s plenty of that vividly described, you can feel the party mood, smell the sweat of the revellers, the aroma of the nyamachoma and even the stench of the urinal, and trigger whatever sense is triggered when you see, smell, and drink alcohol. Good people, First, let me confess that I love Chinua Achebe's book "The trouble with Nigeria." I have been reading and re-reading the book many times. But, my goodness, the similarities between Nigeria and Kenya are abundant. The leadership poverty is the foremost. Yes, we have Kenya Vision 2030, but really, there is nothing much to gloat over three years later. Just lofty conferences with the hackneyed "The Kenya We Want" title, a bloated Cabinet, a media obsessed with politics, a public that literally worships politicians, some clergy who deliberately mislead the flock "just because they pray for us", hungry citizens in arid areas...problems galore. But Kenya is a nice country. It has nice people, magnificent views, some sane police officers who hate corruption, sane journalists who practice public policy journalism, stable economy (but a choking per capita income) and patriots, like me, who hate the maxim, again to copy from Chinua Achebe's sticker, "Love this country or Leave it." In short, I'd just say, I love my country, but I hate the politics of government.I love my country. Keep reading.